Promoting the idea and teaching about sustainable development have always been among the priority of the volunteers of Solidarity Tracks Organization. Recycling workshops, garden maintenance and eco-house building series have already had a history. During the last couple of years these initiatives and activities managed to enter, more or less, into the consciousness of locals and of all-time generations of young people working for the association. Nevertheless, the idea and the events related to sustainable development have not stopped needing greater attention in Lefkada, on the contrary. Therefore, at the end of this week all activities concerning environment protection, and with that the whole team of the organization, will move to the town of Nidri in order to offer a whole weekend experience on sustainable development for kids, their parents and everybody of all ages who cares about nature and Lefkada, who is interested or simply curious about the topic, and especially in the work of its sympathetic group of volunteers. Despite the fact that people of Lefkada city have come across with a great number of Solidarity Tracks posters inviting them to workshops, discussion nights and several other actions only a small percentage voted for active participation in them. The truth is that events promoting environmental consciousness, whether designed for children or adults, generally underscore expectations regarding the number of participants. In addition, while volunteers are continuously striving to find strategies for increasing the interest of locals they are also confronted with the sad picture of a seriously polluted natural surrounding. Therefore, their work sometimes seems to be a vicious circle. Regardless of all these, however, they keep working for raising awareness about problems and about their own presence in Lefkada. There is no reason to deny that the island is dealing with serious garbage management problems which might be related, among others, to the lack of interest in environment preservation. The beaches of Lefkada are uniquely beautiful and they are kept in order, more or less, at this time of the year. However, more remote places with less tourists as well as several yards and gardens are left to suffocate in the garbage thrown by their owners, people who use these spaces and many others who are just passing by. Seeing this attitude of not-caring and its results can easily lead one to the (maybe too straightforward) conclusion that low attendance and modest interest in sustainable development related activities are strongly connected to a mental outlook which omits having almost any element regarding environment protection or caring about the surrounding in depth. Even if this presumption is incorrect and there is no relation between attendance and attitude toward nature, facts do not change: thetrash is everywhere. Of course, there are cases in which the garbage disappears due to initiatives or movements of those who do not turn their head away when they see plastic bottles, bags or else. Nevertheless, when these actions take place people who are contributing to the severe pollution of the lands are generally absent, they keep staying deaf and passive. Meanwhile, other people spend hours on taking away the rubbish, which if thrown away immediately after one ceased using it would have taken seconds or a minute to disappear. Therefore, the first aim one can have as a volunteer in a Lefkadian sustainable development project is to open the eyes of the people and make them receptive. It is essential for the people of the island to understand that they have to learn to care and not always “another” has to do the job. 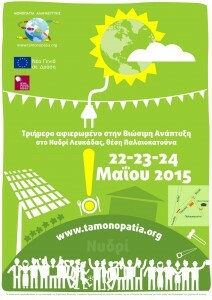 The sustainable development weekend in Nidri, thus, shall be understood as an eye-opening event. Its aim is to show that initiativesrelated to nature preservation have to target the local community and they must have the aim of educating young and old about the importance of developing and implementing a caring attitude toward our surroundings. The event should be everybody’s event, the garden shall be seen as our common space, the same way how every tiny piece of this island should be understood as a shared treasure to which we all have a moral duty to protect. Therefore, anybody who will go and participate in the activities held in Nidri will show a support for the ideas of sustainable development, environment protection and respect to nature. Also, the more interest is shown in the event the happier the volunteers of Solidarity Tracks will be. This means that their belief that a change can occur will be kept alive while they can get the extra motivation as they are working for a community that is receptive to their ideas. So…Dear you, who arrived to this part of the article! Come and participate! Your support is essential and the whole existence of the event will makes sense only if you are there too. The volunteer’s team will be at the field of Eco House in Nidri starting the early hours of Friday, 22nd of May, until late afternoon on Sunday.Feel free to drop by anytime and show that you care! Because many “caring you” makes up an us and with that a difference. We want you there! This entry was posted in Local, Trending, Uncategorized and tagged community, development, environmental protection, Greece, Nidri, opinion, solidarity, sustainable, volunteers. Bookmark the permalink.